THE Eugene Torre of old is back. And the whole world better watch out. 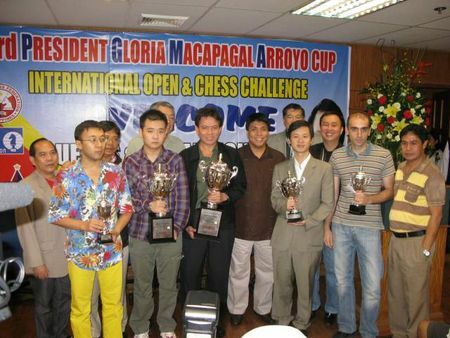 Torre drew with fellow GM Ehsan Ghaemmaghami of Iran in the ninth and final round and then edged last year’s champion GM Li Chao of China and Zhang Zhong of Singapore in the tiebreak to emerge as the overall champion in the third President Gloria Macapagal Arroyo Cup international chess championship at the Duty Free Fiesta Mall in Paranaque City. Hardly bothered by a stunning eight-round setback to fellow GM Mikheil Mchedlishvili of Georgia late Thursday, Torre gave the higher-rated Iranian champion several uneasy moments with the white pieces before settling for the much-needed half point. The draw was reached after only 30 moves of the Pirc defense, one of Torre’s most-played openings during his long and colorful career spanning four decades. Immortalized by Yugoslav Vasja Pirc, the Pirc defense is charaterized by an active position with a control of the black diagonal. “It’s a big honor for me to win this title. I felt like I was young again,” said Torre, at 56 still the most-acclaimed Filipino chess player in history. Overall, Torre finished in a three-way tie for first place with Li and Zhang with similar seven points in the nine-round tournament organized by the National Chess Federation of the Philippienes (NCFP) under president Prospero “Butch” Pichay and secretary-general Tagayaty City Mayor Abraham “Bambol” Tolentino. Li, who bagged the title in a similar three-way tie for first place last year, crushed compatriot No. 8 seed GM Zhou Weiqi, while Zhang halved the point with Mchedlishvili in other keenly-watched final-round encounters. But Torre, the multi-awarded champion from Iloilo City, finished with 2572 tiebreak score against Li’s 2533 and Zhang’s 2532. The three players, however, pocketed US$5,000 each from the combined first to third place cash prizes of US$15,000. Torre thus became the third winner of this prestigious tournament held in honor of President Arroyo, succeeding GM Zhang Pengxiang of China, who topped the inaugural staging in 2006; and GM Li Chao of China, who ruled the event last year. It was also the first major title in almost five years for Torre, who made history by earning his NM title at age 17 (1969), IM title at age 20 (1972) and GM title at age 22 (1974).